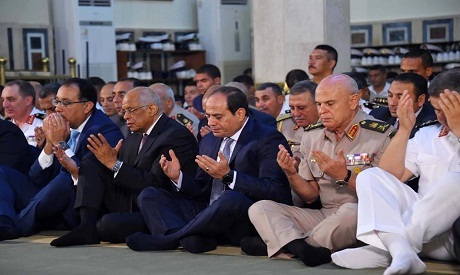 Egyptian President Abdel-Fattah El-Sisi performed Eid Al-Adha prayers on Tuesday at the Mohamed Korayim mosque in Alexandria, Spokesperson for the Egyptian President Bassam Rady said in a statement. El-Sisi was accompanied during the prayers by Prime Minister Mostafa Madbouly, Parliament Speaker Ali Abdel-Aal and top military leaders. Egyptian Muslims celebrated the first day of the annual four-day Eid Al-Adha holiday, which coincides with the start of the pilgrimage to Mecca, on Tuesday with prayers and animal sacrifices. 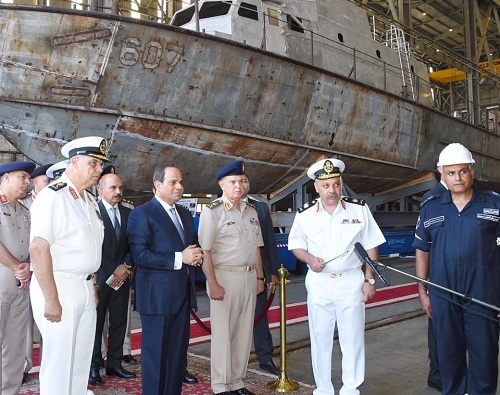 Following Eid prayers, El-Sisi visited an Egyptian Naval Forces' repair workshops along with top ranking naval and military officers. El-Sisi has also inspected construction at the new port at Raas El-Tin in western Alexandria with a total length of 1500 metres. The port project is being carried out by the naval forces. On Monday, El-Sisi extended his greetings to the nation in a tweet. "We thank Allah for these blessed days, and we call upon him to grant us with security, well-being and blessing," the tweet read. Eid Al-Adha marks the Prophet Abraham’s willingness to sacrifice his own son as an act of obedience to God. The celebration is traditionally marked by the slaughter of animals, such as sheep, cows and goats. The meat is then shared between family members and donated to the poor.